Ever since I left the 9-5 in 2017 to focus on writing and blogging, I’ve had to explain myself to a lot of people that still don’t really get it. But now that I am earning $4,000 or more each month as a content writer, its become easier to explain. Personally, I still pinch myself that I get paid to write for other websites and bloggers. While it’s not always easy, it’s definitely a great way to make money online and turn into a full-fledged business. Thanks to the internet, you can make money and earn a good living writing for clients online. The best part is that you get to work at home and create your own schedule. The bad part is that it can take time to gain momentum, build your portfolio, and get clients. But with hard work and determination, you can become a freelance writer full-time or make money outside your 9-5. 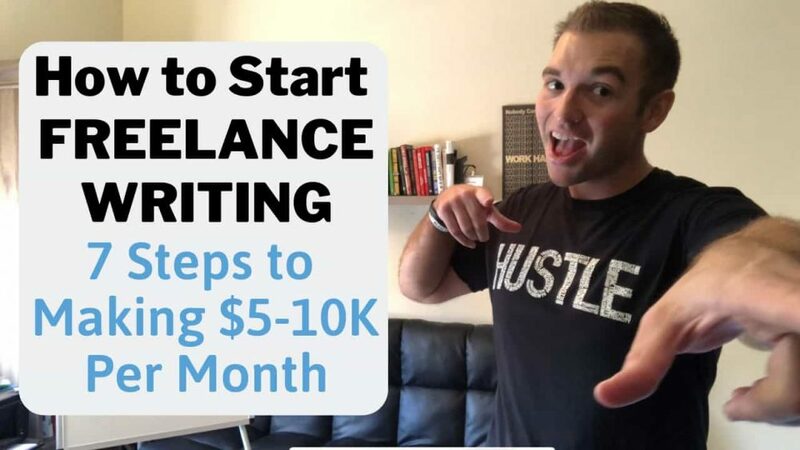 After reading this epic guide I’m 100% confident that you will learn what is freelance writing and have the tools to get started. 1. How do freelance writers find work? 2. What do freelance writers write about? 3. Who pays freelance writers? 4. What are the ways you can get paid as a freelance writer? 5. What are the rates for freelance writing? 6. What skills do I need to become a freelance writer? 7. What is it like to be a freelance writer? 8. Do you need a degree to become a freelance writer? 9. How much money do you make as a freelance writer? Everyone is bound to start freelance writing differently. For me, it was out of my love for helping people and wanting to never work for someone ever again. You might relate to one or both of those. Plus, I wanted to work at home and not have a location or schedule tying me down. Most freelance writers work out of their home but some might opt for a shared workspace. In rare instances, clients might want you to write in their office as well. Freelance writers are also business owners who are responsible for their own taxes. While you don’t need to become an LLC, it’s a good idea to separate business and personal expenses. When you are a freelance writer only half your job is writing, the other half is being a business owner. This includes spending time pitching clients, sending invoices, tracking time, and a variety of other tasks. Here’s the step-by-step process to help you get started. If you’d prefer to watch the video version, make sure to click here or the image below for the Youtube video. To learn how to become a freelance writer you need to realize first off that it’s not going to be an overnight success. There is no such thing as online success in any business to get rid of that belief now. Freelance writing is a skill that is learned over time. As I said, it’s part-time writer and part-time business owner. You need to have a growth mindset if you want to become a freelance writer. You need to be able to push past the fear of uncertainty, rejection, and potential obstacles. Before starting, make sure you know that you are going to need to learn, take feedback, and meet deadlines. With a growth mindset, you can always learn more! Like any entrepreneurial journey, understanding that it won’t be easy in advance, already makes it easier. You might be thinking, what should I actually write about? Creating a niche is important but not as important in the beginning as other bloggers and freelancers talk about. Instead, think more general and niche down as you become more experienced with the entire process. For example, I started with personal finance which is a very lucrative freelance niche. This entailed writing about student loan debt, saving money, homeowning, investing, and other financial topics. But, as you become a more seasoned writer, you can specialize in one or two topics. This is how you can earn more money as a specialist. Don’t be afraid to start as a generalist as a beginner freelance writer. Once you have the mindset and have chosen a niche, next is creating your portfolio. You need a portfolio to showcase your writing samples. While you can use your blog (if you have one) it’s not always the best idea. Often times your blog niche might be different than your freelance writing niche and doesn’t make sense to have off-topic articles. Create a free Upwork profile and upload your samples directly. Build a personal website and upload your samples to your page. More on this part below. Try to write at least five samples before pitching and reaching out to clients. Write these samples for the job you want to have in the near future. Once you have a few samples you can begin applying or even guest post for free on other blogs in your niche. This is a great strategy to meet other bloggers and get your name out there. If that’s the case, you can always hire someone for a minimal fee to build a basic website for you. Ultimately, having your own website makes you look much more professional to potential clients. You can also build your own site for cheap. With Bluehost and WordPress, it’s only $3.95/month. If you are intimidated by this, hire someone to do it so you don’t procrastinate any longer. Remember, your portfolio isn’t just for work samples but to also help potential clients learn more about you. Clients hire people they trust. Make your personal website user-friendly by adding pictures of yourself, significant other, pet or family. Showcase yourself, your work, and your likeability! If you don’t have a blog and don’t want to create a website yet, Medium.com should be your new best friend. This site lets you create a profile in minutes, is 100% free, and can get you massive amounts of free exposure. Medium is a relatively new site but has gained in popularity along with Quora over the past five years. Try to write posts in your ideal client niches. I’ve found with Medium, a personal story can go along the way gaining trust from the audience. As your writing improves start applying for publications to get in front of a bigger audience. I was horrible about this at the beginning of my freelancing journey. Paired with growing this blog, I ended up working way too much and burning out late in 2017. The only good thing that came from it was learning how important a morning routine was to have a proper work/life balance. I can’t stress enough how important it is to create a schedule for your writing. Not only will this keep you sane, but it will also help you write faster and get more done. Find a time that works best for you. Personally, I like the mornings as I find myself more energized and creative after my morning rituals. If you’re a night owl, do it then. Just make sure you stick to a consistent schedule and don’t burn out. This is the part where you have to put yourself out there. You have to find jobs that you think would be a good fit for and apply. Sometimes you will apply through a website specifically, others you will email them a pitch. Stay persistent, pitch like crazy and eventually you will land your first client! These are some of the best freelance writing websites to get your freelance writing career started. Upwork gets a lot of bad press in the freelance writing community as some people consider it a content mill. In reality, it’s only a content mill if you choose to accept those wages. But for beginner freelance writers it’s easy to find potential clients, pitch yourself, and get started instantly. I found some of my best clients and on there that I still work with today. Again, make sure you choose a rate that is fair and not slave labor. Pro Blogger job boards is another super helpful site to get started finding clients. You can apply directly through the site or follow the instructions from each client. Blogging Pro Blogging Jobs is another great place to find your first potential client. Make sure you sign up for their daily email so you don’t miss any writing opportunities. Also, be sure to check out these 50+ freelance writing jobs online to start finding clients. To be a great freelance writer, you need to set goals for different types of activities to stay accountable and motivated. As you won’t always make a ton of money in the beginning, it’s important to set small goals to hold yourself accountable. Whatever it is, make sure you set some freelance writing goals to keep you motivated to succeed. And when you reach a big goal or land a new client make sure you celebrate your victories! As you begin to land freelance clients it’s super important to keep track of your expenses and income. You can do this old school in a Google doc or use a program like Freshbooks. Personally, I love Freshbooks as it makes it easy to track everything, send invoices, and collect payment. Check out all the other resources below to make your life simpler as well. Remember, freelance writing is a business and you need to treat it as such. Like any good business, you should always look for opportunities to invest in yourself and your business. For six months I tried freelance writing with very minimal success. I knew people were making good money from freelance writing but I kept striking out. I would land an occasional Upwork client from time to time but the pay was low. Or I would spend a ton of time writing proposals only to never hear back. I won’t lie, it was discouraging. Luckily I met Holly from Earn More Writing at FINCON in 2017. Holly Porter is a freelance writer who regularly earns over $200,000 from writing online. In the freelance writing community, she is someone to aspire to be like. Freelance writing and blogging have helped her pay off a mortgage and make more than most 9-5 careers ever could. I signed up for her course, Earn More Writing, in December and by January I had earned my money back from one writing gig. The best part? I’m still working with that client. Her course has also helped me learn how to work with editors, ask for raises, and learn how to prioritize my time. While freelance writing is fun, finding the work is not always the most enjoyable part of the job. Obviously, it is necessary because (as I’ve found) without clients, you are not getting paid. Usually, freelance writers specify one specific niche or topics such as personal finance, sports writing or resume writing. These are just a few examples of freelance writing niches. Part of freelance writing is finding work and the other part is doing the actual writing. At the beginning of a freelance writing career, it’s easy to spend 90% of the day searching for freelance writing gigs and 10% on actual writing. As you become more experienced and acquire clients less time will be spent searching and more time writing. And many more options. Freelance writing is about finding a balance between a form of writing you enjoy and something that pays you well for your time. Freelance writers can be paid directly by a client (this could be a single person or a business) as well an agency. Every client will have a different payment system. Per project – You receive the total amount that is not based on per word or hourly rate. If it is a large project you might be paid at different intervals of completion. Payments can be done in a variety of ways. Some clients will not pay until the work is approved and submitted. Others might pay at fixed intervals such as the 1st and the 15th, similar to a traditional 9-5 job. It’s not to say that you can’t make money writing in other niches but these have been some of the most profitable niches online. You need two major skills to become a great freelance writer: time management and persistence. When you are a freelance writer with multiple clients, you need to be very strict with your time. 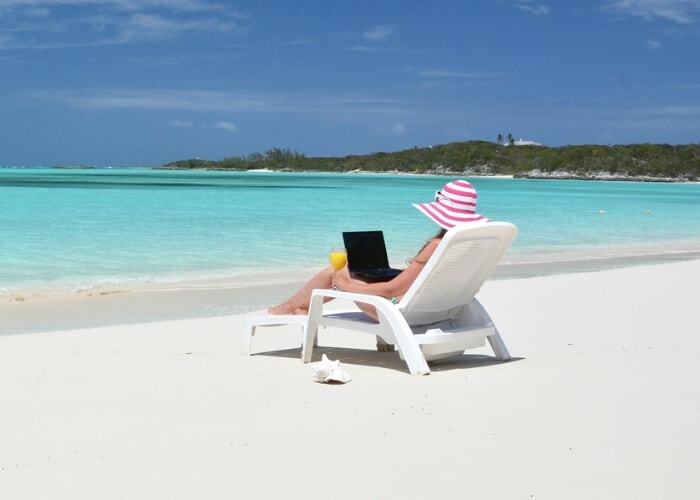 While you might work at home it doesn’t mean you have 100% freedom in your life. You must have a calendar for your drafts and deadlines for all your clients. One missed deadline and you could lose a client and the income for good. The other skill in persistence. Freelance writers must be tenacious. There is a ton of rejection when it comes to freelance writing. Anytime you pitch a new client you have the option of being denied or never even being responded too. Don’t take it personally — it rarely is anything you did! If you want to become a freelance writer that earns consistent money, you must learn to bounce back quickly and keep working toward your goals. Freelance writing is pretty awesome. It’s really hard to beat making money writing articles that can get read by thousands or hundreds of thousands of people online. But, in the beginning, I will say it wasn’t easy. As you earn your stripes as a writer it takes time to learn how to write, pitch, and understand the entire process. After you get the hang of it though, you can write a ton of content in a short amount of time. This can lead to more time to work on other projects, start a blog, spend time traveling or enjoy more time with family or friends. Plus, you can make a ton of money as you gain skills, grow your network, and build your portfolio. While some jobs will say they require a degree, I’ve never had a client ask for any formal certification. You don’t need a degree to become a freelance writer. As long as you write, edit, and get clients you have all the skills to become a freelance writer. The best way to answer this question is with a question. How hard do you want to work? 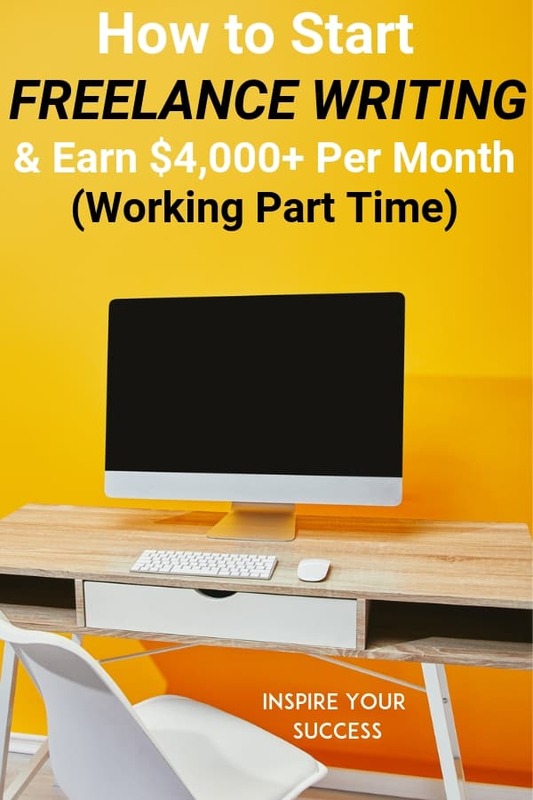 I’ve found that once you get comfortable it’s pretty easy to make $1,000 – $3,000 per month only working part-time hours. But, if you want to earn more in the $5,000 – $10,000 range it will require more work, hours, and effort on your end. But it is 100% possible as I’ve routinely met writers who make over six figures per year! If you want to become a freelance writer, you need to have the right tools to help you succeed. I wish I’d had known about these when I was figuring out how to start freelance writing. Use some of these tools and I promise you’ll become an expert in no time. Every writer needs a billing and bookkeeping system. I’ve used FreshBooks since 2018 as it’s super simple to use, automates much of the busy work, and creates more time for you to focus on earning. If you’re a blogger or podcaster and a freelance writer it might make sense to use Quickbooks. They make it simple to differentiate costs so you can keep all parts of your business separate. If you’re like me, you need some help when it comes to spell checking your work. Grammarly provides an easy way to proofread your writing. This free app scans your work for typos, punctuation errors, and plagiarism. There is a 100% free version and paid one for even more detail. When building your blog or portfolio page, you’ll need to find a host for your website. Bluehost provides great hosting and customer service starting at less than $5 a month. It’s super easy to get set up and very low cost. As I’ve mentioned before, having your own freelance website and portfolio is crucial in becoming a successful freelance writer. Like anything in life, you get what you pay for. And if you want a quality freelance site and portfolio, you need to spend the $50-$75 for a paid theme. There are tons of great ones out there but my personal favorite it Genesis Framework by StudioPress (which this site is running). Namecheap is where I purchase and manage all of my domain names. While you may be able to get a URL from your hosting company, I like to keep mine separate in case I want to switch providers in the future. I recommend signing for 2+ years as you’ll save big. WordPress is going to become your new best friend once you start writing on a regular basis. The more you can learn and understand how to use WordPress, the more likely you are to be a successful writer. Clients love when you can help them out with the little things on the back end. For your tax preparation, TurboTax is a popular tax prep software made by the same company who owns Quickbooks. So, if you’re using Quickbooks and doing your own taxes, these two programs integrate perfectly together. Want to form an LLC to keep all your finances and bills separate? Check out LegalZoom to get started and have everything submitted quick and easy. I use ClickFunnels to customize email opt-in forms, webinar registration pages, sales pages and more. Clickfunnels is fairly simple to use but has a ton of capabilities. and they integrate with almost any email service provider. Thanks to following Pat Flynn for so long I’ve learned the importance of building an email list. And when it comes to sending those emails I recommend Convertkit. This system was made with bloggers in mind as it makes it easy to segment and create automated email sequences. If you’re just getting started and are looking for something free, MailChimp offers a free email service tier for up to 2,000 subscribers (and 12,000 emails/month). The biggest downside to using Mailchimp’s free version is that you can’t send automated email sequences. You’ll have to upgrade to the paid version to get started. This is Google’s suite of tools for businesses and how I create custom emails (i.e. [email protected]). It includes Gmail, Google Drive, video conferencing and more. The price is minimal, starting at just $5 per month! Google Drive provides cloud storage and file backups for documents, photos, spreadsheets, and more. I write all of my drafts in G-Drive for my blog and all of my clients stuff as well. I choose to pay for the upgraded monthly service but you can get a ton of storage for free as well. Tailwind is the only Pinterest certified partner to help you schedule your pins. It’s super easy to use and lets you join Tailwind Tribes and schedule pins for months. I can’t recommend this tool enough! I’ve found in the world of blogging and writing, one way to stand out is your images. Instead of using the same free sites like everyone else, you should invest in a paid software to help you stand out from others. Depositphotos is my go-to spot for quality stock photos. Individual image, monthly, and annual plans are available. Canva is one of my favorite tools on the market! It’s an online photo editing program that can help you create images for social media and Pinterest. The interface is super easy to use and it’s 100% free (paid version is available). Looking for professional looking graphics, web designs, or logos? At 99designs, thousands of designers compete to win your business. iMark Interactive provides monthly maintenance and technical support for WordPress websites. I’ve used them for years and they’ve helped me with so many blogging and WordPress issue’s it’s insane. I highly recommend them if you just need a simple “quick fix,” or setting your entire website. Staying organized is a key to success when it comes to starting your freelance writing business. I use Google calendar to track all of my deadlines so I never miss one. Plus, the calendar syncs perfectly on all devices. Once you start working with clients I’m sure you’ll either use Trello or Asana to collaborate. Trello is a free program that’s great for managing workflow, especially if you’re passing things off between team members. Hopefully, this post has given you plenty of information to get started landing jobs as a beginner freelance writer. I want to help you start earning more money outside of work! Use these steps to learn how to start freelance writing and get paid to write online! Whether you work full-time, part-time or unemployed freelance writing is a great work from home job. With all the freelance writing sites available and using the tips above I’m confident you can hone your skills to start earning money. If you already have freelance writing experience but want to take it to the next level, be sure to check out the “Earn More Writing” course. If you have any questions about how to become a freelance writer, don’t hesitate to let me know as I love helping new freelance writers get started.